When I think of Henry Kulky I think of him playing Otto Schmidlap on Life of Riley television series in 16 episodes from 1953-1958. Kulky was born Henry Kulakowich on August 11, 1911 in Hastings – on – Hudson, New York. He died February 12, 1965 in Oceanside, California at the age of 53. He was a professional wrestler using the name Bomber Kulkavich, before he made his first movie. You would never guess it by looking at him, but he played the piano in San Clemente, California night spots. Kulky was extra busy from 1953-1958, since he also appeared in six episodes of Ozzie and Harriet during those years. His movie career started in 1947, when he appeared in A Likely Story. Kulky’s movie career really took off in 1949, when he appeared in nine films. He would add eight more films to his resume in 1950, with him appearing in 17 movies during 1949 and 1950. 1951 and 1952 were also busy years for Kulky with seventeen more film appearances. 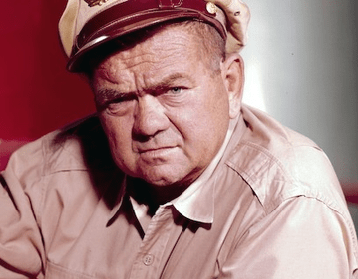 He also appeared in the Abbott and Costello, Racket Squad and Adventures of Superman shows in 1952. From 1947-1952 he had appeared in 39 movies and three television shows. He continued to appear in films and television shows during the rest of the 50’s and would appear in six Red Skelton shows from 1956-1961. Kulky is best known for his portrayal of Chief Max Bronsky in the Hennessey television series, which ran from 1959-1962, in which he appeared in 46 episodes. He appeared in 22 episodes of Voyage to the Bottom of the Sea television series from 1964 till the year of his death in 1965. Kulky appeared in a total of over 80 movies, in only 17 years of being in the movies. I had no idea that Kulky was such a prolific actor, before researching for this article. This website has more info on the career of Kulky, but the wrestling numbers don’t jive, with one portion saying he was 172-3 as a wrestler, while another part says he wrestled in 7,000 matches. Grandson Mark Geisel who was born one day after my birthday. 2001 – Mark Geisel was born on October 15, 2001 in Sulphur, Louisiana, while his father was the manager at the Domino’s Pizza place in Sulphur. Mark has done very well in school and loves to read. He plays goalie and other positions on his soccer team. His red hair goes back a long way in family history. My mom had a red-headed brother, that was born in the 1920’s or 1930’s. My mom had two red-headed sons and a red-headed daughter and a daughter with auburn hair. I was the black sheep of the family with black hair. We moved to Gibbons Street about this time and then moved to Linda Drive later that year in the Kingsville area. September 11, 2001 – A day that will live in infamy. September 11, 2001 was a day that none of us will forget. I had called the mechanic that morning checking on our car in his shop. He asked me if I had the television on and that is when I found out about the horrific events of that day. The memory of those planes slamming into the twin towers of the World Trade Center will forever be ingrained in my memory. I couldn’t comprehend how four planes could be hijacked the same morning and that day let us know how lax our airport security was at the time. The nation was in chaos at the time, with aircraft being grounded all over the country. It was eerie hearing about passengers on these planes talking to loved ones, on their cell phones telling, about the horrors of what they were experiencing and then knowing those same people on the cell phones died a violent death minutes later. It is difficult to believe that September 11 of this year will be the 12th anniversary of that horrific day. The “War on Terrorism” begins with the invasion of Afghanistan. Dale Earnhardt dies during a crash in the last lap of the Daytona 500. Richard Reid known as the “shoe bomber” attempted to blow up an American Airlines plane. The first iPod was released and Wikipedia was launched on the internet. The average rent jumped $40 from $675 in 2000 to $715 in 2001. The price of a gallon of gas jumped from $1.26 in 2000 to $1.41 in 2001. A loaf of bread cost $1.82. 2002 – My favorite memory of this year was the 40th class reunion of Pineville High School. I had never attended a reunion until 2002. If I was scheduled to work on the day of reunion, then I would usually work, but this year I made sure I had that week off, so I could attend. It was great seeing classmates from the 1962 class, for the first time in many years. I hadn’t run into some of them even though they had never left Pineville. The saddest part of the reunion was when the members of our class that had passed on were mentioned in a Power Point presentation, with Duane Yates singing the Lord’s Prayer in the background. Sadly Duane died before our 50th reunion in 2012. Seeing the teachers and students from 1962 again made this a special time in my life. The price of gasoline escalated to $1.61 a gallon, a 36 cent a gallon rise since the $1.26 gasoline of 2000, which was two years earlier. 2003 – This turned out to be the last full year that I worked at the Alexandria Town Talk newspaper. The paper was never the same, after it was acquired by the Gannett Corporation. The Christmas bonus we had received while the paper was owned by the Smith family and the Central Newspapers chain was the first thing to go, under the auspices of the Gannett mega corporation. That $150 we had received each Christmas was now a thing of the past, as was the free newspapers for employees. Iraq is invaded on March 19 by the United States military. Saddam Hussein is captured by the U.S. 4th Infantry Division. Gasoline prices jumped to 1.83, a jump of 57 cents a gallon since 2000. 2004 – My 36 years at Town Talk and 38 years in newspaper production ended in 2004, when I retired with my last day of work being Halloween night. I spent most of my working life at Town Talk. In fact it was my first job after returning from Vietnam in 1966. I had seen my pay go from $1.40 an hour in 1966 to $13.50 an hour in 2004. Still I never took home more than $28,000 in any year, that I worked for the Town Talk. We had a traumatic event this year when my stepson Justin was sleeping in the den and was woken by a burglar, who was rifling through cabinets and drawers, while looking for painkillers. Neither Justin or the burglar knew anyone else was in the house. Thankfully, Justin thought the burglar was a relative, who told Justin he was taking stuff because his mom owed him money. A few days before the burglary a man had knocked on our door and wanted to know if anyone lived in the trailer next door. Evidently, he was casing the house and had a timeline of when my wife Rhonda and me would be at work. Anyway he had left, about 30 minutes before I arrived home from work that night. Justin followed him from room to room and the burglar told him to tell his mom, that he would return the next night. The burglar did have an encounter with our cat, when the cat bit him and the burglar said “ouch”. The burglar would be later caught due to his own stupidity. He overdosed and the paramedics noticed painkillers all over his trailer, which included some painkillers my wife had in our house, after having major surgery. He lived only about five houses up the street from us and was arrested for burglary and sent to prison. Facebook was launched in 2004 and was originally only for students at Harvard University. Strongest earthquake in 40 years hits near Indonesia and the earthquake and resulting tsunami would take 290,000 lives. Martha Stewart is convicted of felony and sentenced to five years in prison. Gasoline continued to skyrocket to $2.10 an increase of 84 cents a gallon from the year 2000. Oil peaked at $50 a barrel in 2004. 2005 – I returned to work in 2005, when I was hired as a caregiver by Louisiana Community Care in Ball, Louisiana. Sometimes I would start a shift at 8PM and would finish the shift at 8:30 AM the next morning. It wasn’t hard work, but it was detail work, that required a set schedule of administering medicine. I found out later in Tennessee, that anyone administering medicine in Tennessee was required to take a course and pass a test to give meds to a client. However, Louisiana required no certification to give meds. I was giving meds my first night. There was a voluntary meds certification, but it wasn’t required at this time. Later that year I went to work for Plasti-Pak in Kingsville area and I learned how much work is involved with factory work. I operated a box making machine for Procter and Gamble products the first night there. We went to work at 6:45 PM and the shift would end at 7:15 the next morning, so we would get a full 12 hours per shift, with a half hour break to eat. It was tiring and exhausting work and dangerous work. I back over my foot with a hand truck, which resulted in losing two toenails. I bought steel-toed boots the next day. It was a temp job with Westaff and the job played out soon and I was one of first laid off, since I was one of the last ones hired. Then I went to work for Coastal Culvert operating out of Eunice, Louisiana. It was the easiest job of my life, after working the hardest job of my life at Plasti-Pak. My job was to be the manager of a new Alexandria branch for the company. My main job was to check inventory of the culvert pipes outside the office. I had to call the Eunice office each morning, to verify I was at work. Then I would read the paper, listen to old-time radio shows or watch Andy Griffith shows on the DVD player till it was time to go home that afternoon. The job lasted from November till February of 2006, before they decided to close down the Alexandria office, since there was little to no business. I can’t say enough good things about the Coastal Culvert executives. They invited me to their annual Christmas dinner and they gave me a $100 Christmas bonus, even though I had been there less than a month. Some of the damage from Hurricane Katrina seen the day after. The major event of 2005 in Louisiana is when Hurricane Katrina hit the southern coast of Louisiana and a break in the levee resulted in 80 percent of New Orleans being flooded. 1,577 died from Katrina in Louisiana. Many New Orleans residents waited five days for food and water to arrive in the city. It was a colossal case of bad planning by government officials, who let people go for days without food or water. Katrina didn’t cause much damage in Alexandria-Pineville area, but Hurricane Rita was a different story as many trees fell on houses in the area, with fallen trees closing roads. Lance Armstrong won an amazing seventh Tour de France championship, as he demonstrated how he could live better through chemistry. Video gamers saw the Microsoft X-Box 360 launched in 2005. The price of gasoline climbed to $3.18 in 2005 an increase of almost $2 a gallon from the $1.26 price of 2000. 1976 – We started the year of 1976 still working at Monroe Morning World. My wife was unhappy with her job and I found out there were two openings for my old job at Town Talk. So we moved back to Pineville, Louisiana at the Quail Creek Apartments off of Stilley Road in Pineville. It was good to be working in cold type again, after working with hot metal the previous two years in Monroe. My salary was $159 a week, when I left the Town Talk in 1974 and my salary had increased to $190 a week during the two years in Monroe. There were some negotiations with Town Talk personnel manager, who didn’t really want to pay the $190 salary, but I knew there was no way, that I would accept a cut in pay. He eventually agreed on the $190 salary, which totaled $9,880 for a year. Can remember watching television that July 4, as the United States observed the 200th birthday since the Declaration of Independence. 1977 – We saw Elvis Presley at the Rapides Parish Coliseum in March. The seats were in the nosebleed section and we could barely even see Elvis, unlike our seats in Monroe, when we were on the floor, in about the 20th row from the stage. Elvis got sick that night and had to rest, while one of the backup singers sang a solo. We could tell that Elvis had gained a lot of weight, even sitting near the top of the coliseum, in seats that were the worst seats in the coliseum. Elvis didn’t even appear, at a scheduled Baton Rouge concert a couple of days later and was taken back to Memphis to Baptist Hospital. We were watching the news on television in August of 1977, when we heard the news that Elvis had passed away. It came as a complete shock and it would be revealed later, that Elvis had a serious drug habit, that resulted in his death. This August marks the 36th anniversary of his death. Elvis would be 78 if still alive today. 1978 – My daughter Debbie was born on June 13 at 11:31 AM on a Tuesday at Rapides Hospital. We finally had cable television installed at the Quail Creek Apartments in 1978 and can remember being able to watch the Atlanta Braves on the WTCG Channel 17 superstation in Atlanta. We also were able to watch mostly Chicago Cubs games on WGN superstation out of Chicago. 1979 – We moved to our new home at 310 Burns Street in Pineville. I had remembered that house being built in 1958. The Louisiana College head football coach Les Patrick moved into the home. We lived across the street at 313 Burns Street, where we had lived since 1952. So it was like going home to live across the street from the house I had grown up in. So we moved into the house that had been built 21 years earlier. 1980 – Can’t remember much in the way of local news in 1980, but it was the year that John Lennon was shot outside his hotel. Other news that year included the election of President Ronald Reagan as he defeated President Jimmy Carter in the general election. Jessica Simpson was born in 1980 and will be 33, on the 10th of July. A new Ford Pinto Pony automobile cost $3,910, while gasoline cost $1.19 a gallon. United States boycotted the 1980 Olympics, because of Russia had invaded Afghanistan. Ironically, Russia left Afghanistan, while U.S. is presently in Afghanistan 33 years, after the Olympic boycott. My grandson Matthew hitting his first home run in a Texas Little League game in ninth year of youth baseball. Friday, July 1, 2010 will always be a red-letter day for my grandson Matthew. He hit his first home run over the fence after playing youth baseball for nine years. Most importantly, the home run gave his team, the Groves National League All Stars, a 1-0 lead in a game in which they would defeat the Bridge City All Stars by a 3-0 score. His home run brought back memories of the Little League game about 54 years ago when I hit a ball over the fence, only to have it caught by the center fielder who reached over the fence to catch it. That was the only time I ever hit a ball that far before or after that long out. So it made it even more special when Matthew hit his first home run. I have seen Mickey Mantle and Roger Maris hit home runs in a baseball game, in Kansas City in 1962. That was nothing, though compared to the feeling when the ball went over the fence and disappeared last Friday night. It was the only run in the game that scored as a result of a hit and gave the Groves National League All-Stars a lead that they would not relinquish. It was also one of three hits recorded by Groves. The home run was even more remarkable, when considering the opposing pitcher throws 75 MPH and pitched a great game to hold Groves to three runs. However, Matthew’s teammate Nathan pitched an even better game allowing four hits while throwing 44 strikes in 58 pitches according to the boxscore posted on the Bridge City website. It is not surprising that Matthew was swinging a plastic baseball bat as soon as he learned to walk. By the age of four he was playing Wee Ball which is the step before Tee Ball in Louisiana. He has always played with a smile on his face and just enjoys being on the baseball diamond. He has been on several All Star teams and his Tioga, Louisiana All Star team played in the state championship game one year and lost to a very good pitcher. Matthew batted 1.000 in the state championship game and only one other player even got a hit off that pitcher. When I played a full season of major league games using my APBA Baseball board game in 1959, I never thought that my grandson would be playing the same APBA game 53 years later. He keeps extensive stats for each player including assists. The difference was that when I played the game, there were only 16 major league teams, playing a 154 game schedule. Matthew’s game has 30 teams playing a 162 game schedule. Matthew hopes to become a major league baseball player someday. I hope his dream comes true. It isn’t easy to become one of the 750 players playing in the major leagues today. However, Matthew doesn’t mind hard work and has a good work ethic. I can remember when he would want me to keep throwing him grounders and flies, even though it was hard to even see the ball with no lights in the yard. He would stand in the yard across the street, so I could throw him long fly balls so he could get used to catching them. He has played either shortstop or third base for the last few years and pitched four innings of no-hit baseball earlier this season. I only hope I live long enough to see Matthew achieve his dream of playing in the majors, but time may be running out for me, since I am 67 and most players don’t reach the majors till they are 21 or 22. That would make me close to 80 before he could make it. One thing for sure is that I will never discourage him from pursuing his dream. I just hope he follows his dream to the major leagues, whether I am around to see it happen or not. June 9 is a special day since the last two major league games I have seen have been at Minute Maid Park in Houston on June 9, 2009 and again last night on the same date two years later. The first time we were in the nosebleed seats down the left field line when the Cubs played the Astros. The seats were only $7 but were so far from field, it was almost like not being there. The players looked like little stickmen that night and it was difficult to tell one player from another. However, last night was totally different as we sat in the 19th row of seats in the right field bleachers in the first deck. The only negative thing about the seats was that we were on the wrong side of the giant scoreboard so we couldn’t see it at all. The seats cost $21 each, which included a free hot dog, chips and 16 ounce soft drink. The seats were regularly $27 each so it is safe to say that we saved at least $7 on the free food and $6 on the seats for a savings of at least $13 and maybe even more depending on the price of the food and drinks. Sitting in the right field seats, we could see the rightfielders Hunter Pence for the Astros and John Jay and Skip Schumaker who both played right field during the game for the Cardinals. It was exciting to see Hunter Pence extend his hitting streak to 20 games on an infield hit in the first inning. Then later that inning Brett Wallace singled to left field scoring Pence, but Carlos Lee was tagged out when caught between second and third, ending the inning. No reason to go into detail on all the scoring, since it was a one-sided game for the Cardinals. Ryan Theriot and Lance Berkman hit solo homers in the eighth and ninth innings to finish the 9-2 rout by the Cardinals. One of the highlights of the game, was when reliever Wilkin Lopez sprinted full speed, from the center field bullpen to the pitcher’s mound, when relieving the starter J.A. Happ. My grandson Matthew, enjoyed the win by the Cardinals, since he is a huge Albert Pujols fan. He wanted to see Pujols wear a Cardinals uniform one last time, since he is likely to test the free agency waters this fall and likely to sign with the highest bidder. Matthew hopes to play in the major leagues someday and I hope he realizes that dream someday. A lot of things have to fall in place for that to happen, but seeing the game last night didn’t do anything to make him give up on his dream. It has been 54 years since I saw my first major league game when the Philadelphia Phillies hosted the Pittsburgh Pirates in Connie Mack Stadium. It was a kid’s dream come true to see the players in person that I had seen on television. Roberto Clemente played in the game for the Pirates and Richie Ashburn played for the Phillies. Both would be admitted to the Baseball Hall of Fame with Clemente being voted in posthumously after dying in a plane crash to deliver food and supplies to earthquake victims. One of my biggest thrills ever was seeing Mickey Mantle and Roger Maris hit home runs in a doubleheader between the New York Yankees and Kansas City Athletics in Kansas City in 1962. It had been a year earlier when Maris had set a new season home run record in 1961. Whitey Ford a Hall of Fame pitcher for the Yankees pitched in one of the games, pitching a nine inning complete game while pitching a 16 hitter. Those days are gone forever as no starter stays in a game today if he allows 16 hits. Meanwhile back to last night, it reminded me once more of how much I love the slow pace of baseball games, which is the reason some people don’t like it. I can see where fans could tire of the length of the games. Last night’s game was over three hours and played in front of 24,000 fans. Most of the fans left after the Astros failed to score in the seventh inning, as the fans poured out of the stands. The temperature was 73 degrees since the roof was closed during the game on a muggy day in Houston. Last night was a night to remember. The game had plenty of scoring by the Cardinals while the Astros were 1-8 with runners in scoring position which was disappointing to Astros fans. There is something about a well manicured baseball field that makes watching a baseball game special. The result of the game may not have pleased the Astros fans, but I expect a lot of the same fans to be there tonight when the Atlanta Braves take the field in Minute Maid Park tonight. The more baseball changes, the more it stays the same. From being a 12-year-old kid watching my first game in Philadelphia 54 years ago to watching the game last night at the age of 66, I am still a kid at heart.